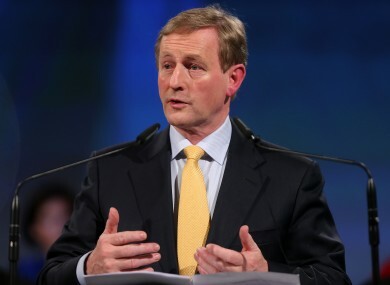 Taoiseach Enda Kenny giving his speech this evening. TAOISEACH ENDA KENNY has said today’s report on the deaths of four babies at Portlaoise Regional Hospital “makes for grim reading”. The report, written by Chief Medical Officer Dr Tony Holohan, found that patients and families were treated in a poor – and at times – appalling manner, with limited respect, kindness, courtesy and consideration. It also emerged today that the death of a fifth baby born at the hospital’s maternity unit is currently under investigation. This evening the Taoiseach commended his party colleague, Health Minister James Reilly for his “decisive and swift action on the matter”, pointing out that all of the eleven recommendations in the report have been accepted and are being implemented immediately. The minister has ordered an analysis of midwifery workforce planning across the country and an interim management team has been put in place at the hospital from today. He conveyed his sympathy to the families who lost their babies and said it is through their resolve that this change is happening. Email “Kenny: No family should have to fight for truth in our health system”. Feedback on “Kenny: No family should have to fight for truth in our health system”.